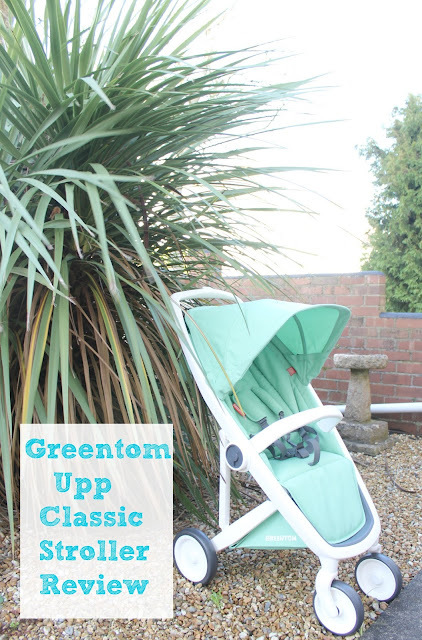 I was recently invited to review a new lightweight stroller, the Upp Classic, from a company I hadn't previously heard of - Greentom. 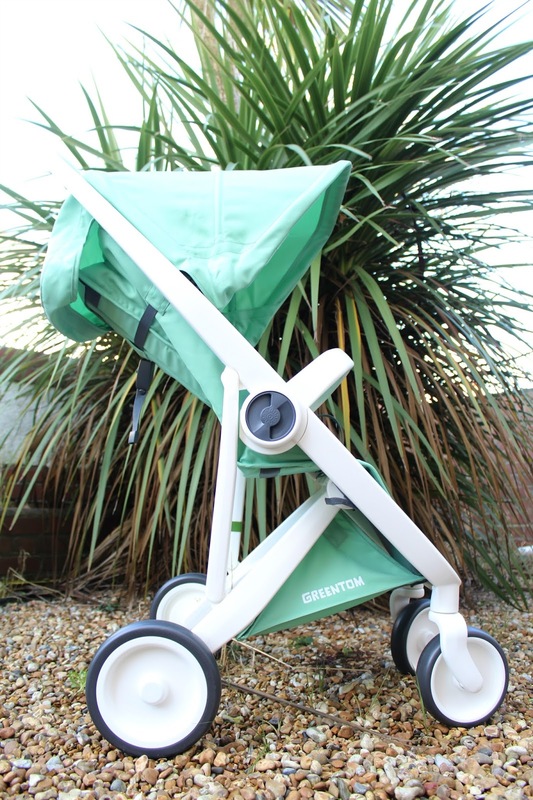 For those of you who’ve also not heard of them, Greentom was started by a Dutch designer who wanted to cast a fresh eye over strollers. The designer, Bart Bost, wanted to re-think strollers. He also wanted to create products that were 100% green. 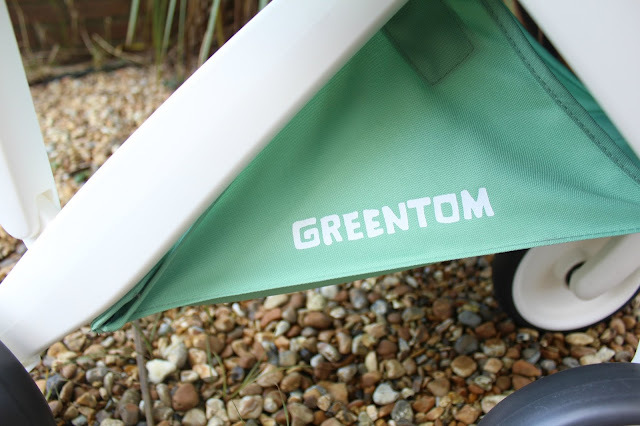 Greentom claim that the Upp is the greenest stroller on the market designed for the future and back this claim up in the way they have created the Upp. The idea of ‘less-is-more’ was the design mantra with every part of the Upp to be optimised and made from sustainable and recycled resources. 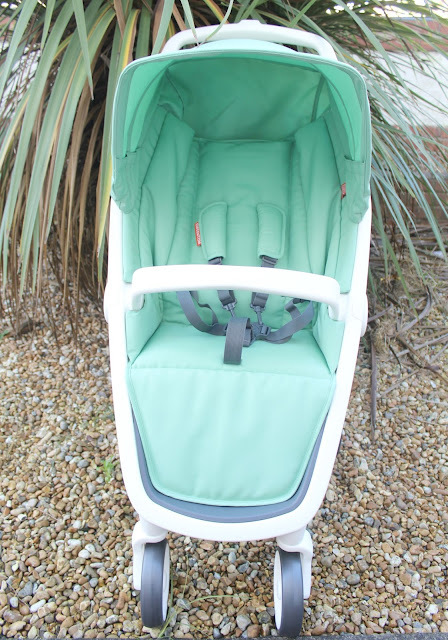 The fabric used in each stroller is made from recycled plastic bottles, the frame is made from sustainable resources and the strollers themselves are manufactured all over the world from local sources and to reduce any carbon footprint created by transporting products - quite innovative, right?! Greentom even state that when you are done with your stroller you can return it to them and they will recycle and reuse the components. Pretty cool thinking and kind to Mother Earth, at last a stroller that doesn’t prick your conscience. When I received the Upp, upon opening the box I noticed there was no polystyrene, no bags of parts, just recycled cardboard and a largely assembled stroller - SUCH a welcome change from the usual mountains of plastic and cardboard you have to fight your way through with such a product. Upon lifting it out of its box, all I had to do was attach the front bar and hood and it was ready to go. The whole process took less than 5 minutes, and I was immediately impressed. The model I was sent is the Greentom Upp Classic in Mint with white chassis. After admiring the the very clean, modern and sleek design, I was taken aback at how light it is. Being heavily pregnant the last thing you need is a stroller that weighs a ton. The Upp however, even with a 10 month old in is just a breeze, it glides along and is so comfortable to use thanks to the ergonomic design. Not only is it a joy to push, but the breaking system is also simple to use yet very firm when applied. Thanks to the design, no suspension is used. Instead, the plastic frame of the stroller allows any bump to be absorbed and dissipated throughout the frame. 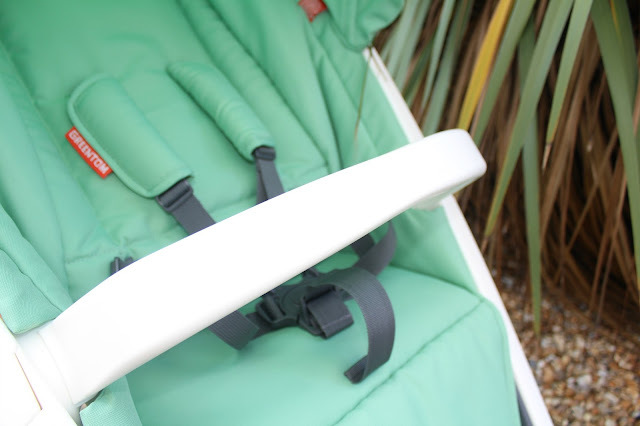 The seat of the stroller contains a 5 point safety harness for your little one and is very spacious. The harness has colour coordinated shoulder pads and is totally adjustable with each strap featuring an adjustable buckle. This feature allows the Upp to accommodate your tot through each stage of growth without it becoming tight or uncomfortable for your little one. So safe, comfortable and good looking! At this time of year or any other time, it’s no fun having a stroller that is awkward when you come to fold it up. 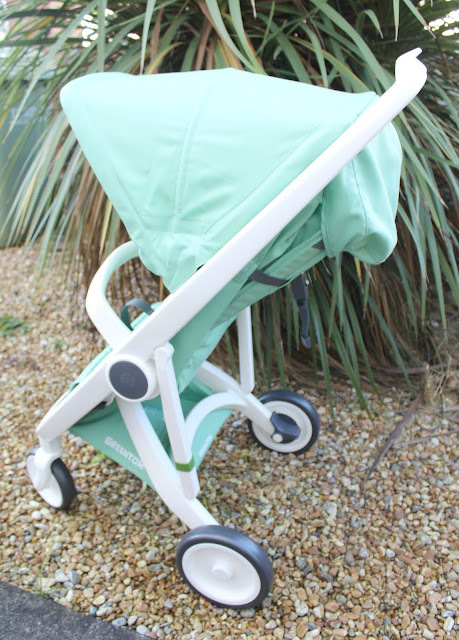 The collapsing system on the Upp is so easy and consists of simply one button. From standing to folded, the whole process takes seconds. Upon folding, the Upp folds away so compactly it won’t dominate the boot of your car and is so light it can be lifted using one hand. Upon our first test drive, Noah really enjoyed his new Upp and looked snug as a bug. He must have been very comfortable in it and it wasn’t long before he’d drifted off to sleep. Located beneath the seat is a small shopping basket. Whilst not the largest basket in the world, it is perfectly adequate for day to day items as well as a changing bag etc. Noah loves his new stroller and I love taking him out in it. The Greentom gets a big ‘ Tom Thumbs up’ from this happy tot and his Mummy.